2nd Anniversary Giveaway #1: Manang's Chicken! This giveaway has already finished. Winner announced here. Let's welcome July with a big bang! This blog turns 2 this month! Can you believe it? I can't too, and it's unbelievable I've gone this far. Thanks to you guys! Manang's Chicken is one of my favorite lunch spots since it opened back in 2011. I just love the Manang's Chicken Original. Aside from the chicken, I'm addicted to Manang's Chips and Dip and the Red Velvet Sundae. The Cheezy Spaghetti recently caught my fancy (and I always forget to take a photo because I dig in as soon as it's served to me. hehe). I am huge with anything Asian, especially Thai. I could say that I'm getting better with tolerating spicy food because I fell in love with the cuisine of our neighboring countries. Foodie.ph is a new online delivery service where you can order food from your favorite restaurant for minimum amount of only Php 300! What's even cooler is that they accept orders 24 hours a day, 7 days a week. :) But they’ll have a call-in number in the next few weeks. Here are the screenshots of my online order via www.foodie.ph. It’s super easy! It was a sunny morning when I arrived at Mario's. It was Saturday and it was a little early for me, as I usually wake up at noon during weekends. But I have heard only positive things about Mario's so I wouldn't dare not try it. Mario's first branch opened 1971 in Baguio City by Mario and Nenuca Benitez. 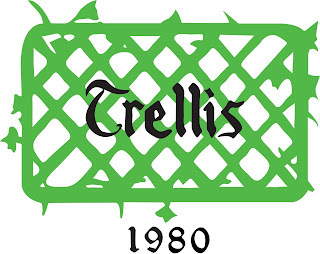 The Tomas Morato branch opened three years later and has been in the same location since. Suffice to say that it's one of the oldest restaurants in the area. A few hours after our sumptuous LUZVIMINDA lunch at F1 Hotel Manila, my fellow foodies and I were invited to watch the chefs cook amazing dishes from their home regions. LUZVIMINDA is F1 Hotel Manila's Filipino Food Festival, which runs for the whole month of June. This festival features dishes from LUzon, VIsayas and MINdanao by guest chefs: Chef Martin Jickain for Luzon, Chefs Karl Noel and Sidney Uy for Visayas and Chef Ed Tuazon for Mindanao. The demo was hosted by F1 Hotel Manila's Executive Chef, Chef Sau del Rosario. 1. Heat pot with water and bring to a boil. 2. Put shrimps and boil for approximately 1 minute. 3. Drain and put on an ice bath and set aside. 4. In a mixing bowl, mix vinegar, sugar, garlic and season with salt and pepper. 5. Combine pako, tomato, red onions, shrimps and salted egg. Drizzle with vinaigrette. I've always been a huge eater because I really have this crazy metabolism. But I guess it's getting slower (most probably because of aging, hmph). My friends know that they either have to feed me or run away. haha. The interiors of Causeway is quite straightforward, surprisingly spacious actually. KC arrived before I did and she got the booth for us. We started with the house tea while we were waiting for the dimsum cart to arrive at our table. Almost every dimsum is available in the cart except for the Hakao. It was during breakfast when Spanky asked if we wanted to have lunch at Singapore Food Republic, a few blocks away from F1 Hotel Manila, where we spent the weekend along with other foodie friends. Having eaten at Nasi Lemak for several lunch breaks already, I wouldn't dare say no to one of the best Hainanese Chicken in the metro. The ambiance of Singapore Food Republic is a far cry from Nasi Lemak. The resto is spacious, with high ceiling and mezzanine area. We had the mezzanine area to ourselves that afternoon. After our food trip at Levante, my friend Rhoda and I decided to walk towards Eastwood Mall to have some desserts, or maybe coffee. Calling all photography enthusiasts! 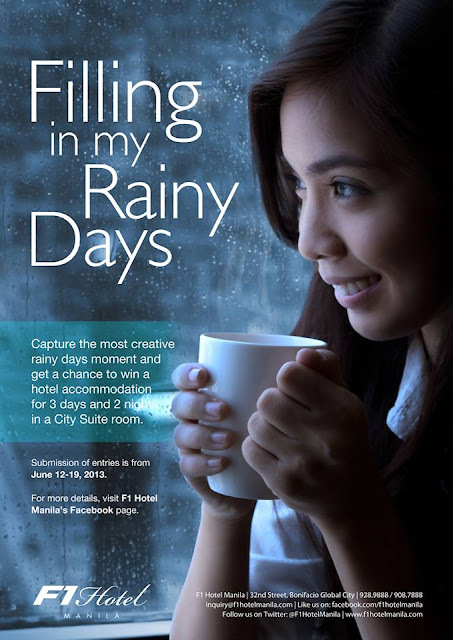 Here's something to do this rainy season: join F1 Hotel Manila's Rainy Day Photo Contest. Have your photo displayed at F All Day Dining Restaurant and win accommodations at their hotel! 1. Photos should be artistic and should portray a scene of how Filipinos usually spend their rainy days. The presence of rain is not required, but is preferred. 2. Like F1 Hotel Manila’s Facebook page FIRST. 3. 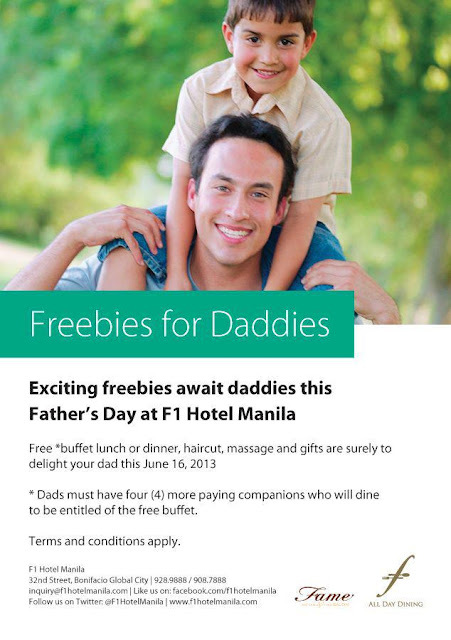 Mail your entry to F1 Hotel Manila Facebook Page and wait for the email response. 4. There will be three (3) winning photos; 1 Grand Winner and 2 Runners-Up. 5. The photo/s with the most likes & shares on Facebook and re-tweets from Twitter (plus the added points from other social media accounts) win/s. 6. Grand winner will get 1 voucher of 3 days & 2 nights accommodation in a City Suite with buffet breakfast for 2 and their winning photo will be displayed at F All Day Dining Restaurant. It has been almost a lifelong search for me to experience real Italian food. Not American-Italian, not Filipino Italian, but real Italian. It was fortunate that I got invited by Lombardi's to have dinner at their 2nd branch, opened last month, at Shangri-la Mall New East Wing which . The mostly-red restaurant wasn't difficult to spot even from afar. I love the modern yet rustic interiors of Lombardi's. It somehow reminded me of the restaurant makeovers in Kitchen Nightmares. Most people in our group was pleasantly surprised that the guy behind the name Lombardi's is actually a real person: Chef Davide Lombardi (pronounced as Da-vee-dei). Chef Davide was born and raised in Milan, Italy and is currently a chef instructor at Center for Culinary Arts - Manila. Before we were served the antipasti or appetizers, we were served the complimentary toasts with olive oil. It's been months since I actually had a vacation, and to someone who loves travelling, it would seem like years, decades even. 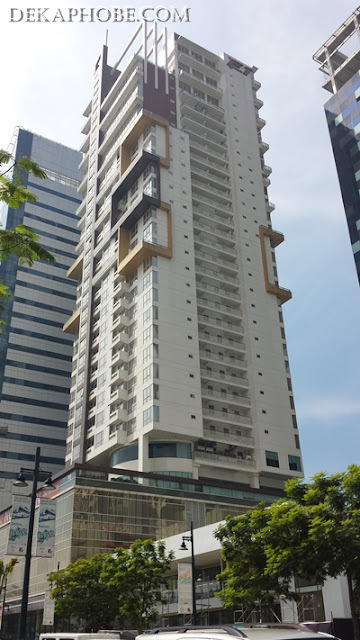 That's why I was pleasantly surprised when I was invited to spend a weekend at F1 Hotel Manila. Girl badly needs relaxation. F1 Hotel Manila is the first hotel to open at Bonifacio Global City. With its strategic location, modern facilities and delicious food, F1 Hotel is a perfect staycation spot for everyone. The hotel's main lobby is located at the 5th floor. We were asked to proceed to the Premier Lounge at the 3rd floor where we were served freshly brewed coffee, fruit juices and pastries. I spent the first weekend of June at F1 Hotel Manila with some foodie friends for a quick staycation. I was personally ecstatic as I enjoyed my summer staying home and complain about the extreme heat. Yeah, I'm weird that way. Formerly known as Best Western Premier F1 Hotel, this hotel conveniently located at Bonifacio Global City has undergone drastic changes and is now an all-Filipino staycation destination. We were also there to experience their Filipino Food Festival called LUZVIMINDA, which runs from June 1 to June 30, 2013. F1 Hotel Manila's new executive chef, Chef Sau Del Rosario with Chef Willie Ertez, got the help of brilliant chefs from all over the country for this month-long food festival: Chef Martin Jickain of Station Juan Cafe Boracay for Luzon, Chef Karl Noel of Casa Verde Cebu and Chef Sidney Uy of Frontgate Cebu for Visayas and Chef Ed Tuazon of Marco Polo Davao for Mindanao. Long before the first Starbucks branch opened in our lovely city, there's already this quaint cafe named Seisha Coffee. It is actually very popular that I always see it crowded whenever I get the chance to pass by. I have visited its two locations: one near Cafe Dozo and the other near Antipolo Cathedral. This post will be combination of those visits. What makes Seisha Coffee unique is the shisha or hookah. Shisha is a waterpipe used to produce smoke, it is mostly common in the Middle East. I really have no idea on why a coffee shop would sell shisha but then, some smokers I know drink coffee while smoking. A shisha costs Php 180 for half load and Php 250 for full load. Hillside Ranch was started by Atoy and Chay Tayag, who both came from culinary clans of Pampanga. Atoy is the nephew of Claude Tayag (of Bale Dutung) while Chay's mother owns Binulo Restaurant in Clark. Atoy's family also owns Mother Earth, a meat processing business also based in Pampanga. They currently have two products: The Slow Roasted Beef Belly and Corned Beef Brisket. Hillside Ranch products are microwaveable, so you can enjoy some beefy goodness without the hassle. The aroma of beef belly cooking in a hot pan welcomed me as soon as I arrived, if it was waiting for me to grab it. Manang’s Chicken is a restaurant offering unique and quality Filipino-inspired dishes in a fast-casual setting. 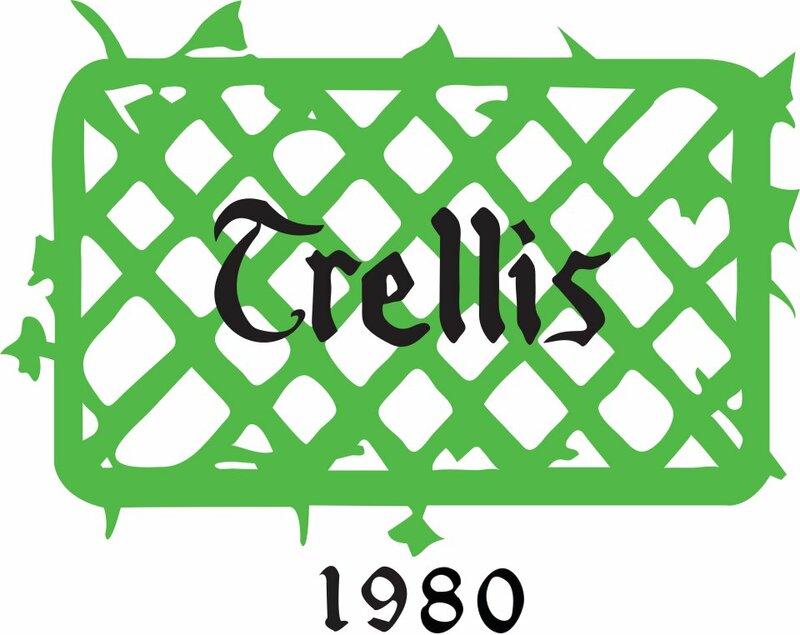 It was founded in 2010 and has evolved to be one of the fastest growing fast food restaurants in the country today. 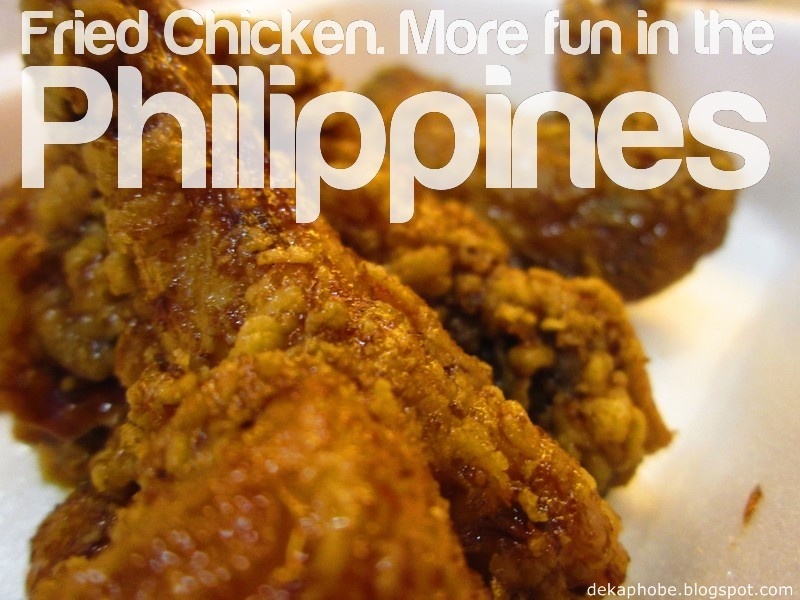 Their specialty is the signature double deep fried chicken tossed in a special soy garlic sauce but has expanded their menu to other Filipino comfort food like pancit, spaghetti, sandwiches, chips and other rice meals. To kick off the school season this June, Manang’s Chicken is bringing back the “Pabaon ni Manang” coupons. Present the coupons upon order and enjoy instant treats for free! Coupons entitle bearer to lots of food freebies such as Cheezy Spaghetti, Sundae Cone and Manang’s Chips & Dip. Aside from free food items, you also get a coupon to upsize chips and drink at no extra charge or waive Php 40 fixed delivery fee. Coupons will be distributed in all Manang’s Chicken branches and can be printed out from their website and Facebook page.